WASHINGTON — President Donald Trump's personal attorney Rudy Giuliani said Sunday that plans to build a Trump Tower in Moscow remained an "active proposal" as late as November of 2016, leaving open the possibility that Trump's orbit continued to pursue the business deal up until the presidential election, months later than previously known. Appearing on NBC's "Meet the Press," Giuliani said the president has told him he can "remember having conversations" with his former lawyer, Michael Cohen, about the project well into 2016. Cohen has pleaded guilty to lying to Congress about the timeline of his involvement in that proposal, admitting that he worked on it through June of 2016 after initially saying it ended at the beginning of that year. "It's our understanding that they went on throughout 2016," Giuliani said of the discussions, adding that there "weren't a lot of them, but there were conversations. 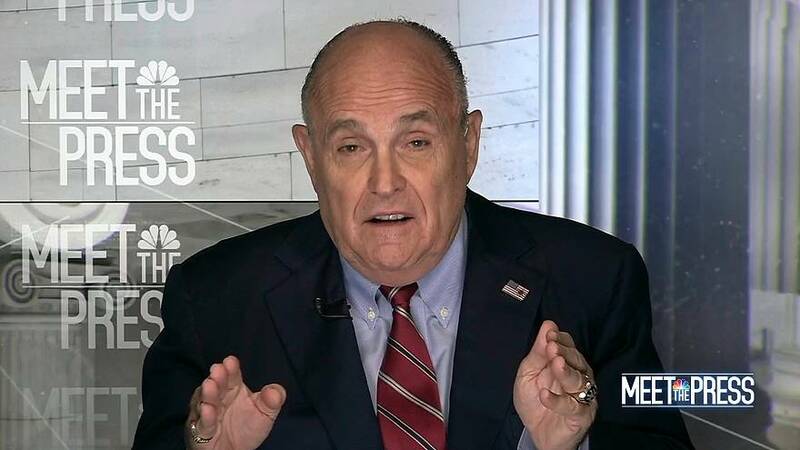 Can't be sure of the exact date," Giuliani said, referring to written questions Trump and his lawyers have answered from special counsel Robert Mueller's office. "Probably could be up to as far as October, November. Our answers cover until the election. So anytime during that period they could've talked about it. But the president's recollection of it is that the thing had petered out quite a bit." "I would say Michael Cohen would have a much better recollection of it than the president," Giuliani added. "It was much more important to him. That was his sole mission. The president was running for president of the United States. So you have to expect there's not going to be a great deal of concentration on a project that never went anywhere." Also appearing on "Meet the Press," Virginia Democratic Senator Mark Warner said that the idea that negotiations could have continued into November was "big news." "That is news to me, and that is big news. Why, two years after the fact, are we just learning this fact now when there's been this much inquiry?" Warner, the top Democrat on the Senate Intelligence Committee, asked. "I would think most voters—Democrat, Republican, independent, you name it— that knowing that the Republican nominee was actively trying to do business in Moscow, that the Republican nominee at least at one point had offered, if he built this building, Vladimir Putin, a free-penthouse apartment, and if those negotiations were ongoing up until the election, I think that's a relevant fact for voters to know. And I think it's remarkable we are two years after the fact and just discovering it today." The Moscow tower project is part of investigations by the special counsel and lawmakers into links between Trump's campaign and Russia's interference in the 2016 election. Cohen has said he lied about the length of his involvement in the process in order to be consistent with Trump's own public pronouncements that he wasn't involved in business dealings with Russia. The questions about Cohen's motives were also caught up in a disputed story published by BuzzFeed that claimed Trump personally directed Cohen to lie to Congress. That accusation prompted Democrats to immediately sound alarms, with some calling for impeachment proceedings. But one day after the story's publication, special counsel spokesman Peter Carr said in a statement that "BuzzFeed's description of specific statements to the Special Counsel's Office, and characterization of documents and testimony obtained by this office, regarding Michael Cohen's Congressional testimony are not accurate." BuzzFeed has said it stands by the story. On Sunday, Giuliani said he was "one-hundred percent certain" that Trump never asked Cohen to lie to Congress. "The Justice Department and the special counsel's office said that the story was inaccurate. And the inaccuracy is that there's no evidence that the president told him to lie," he added.